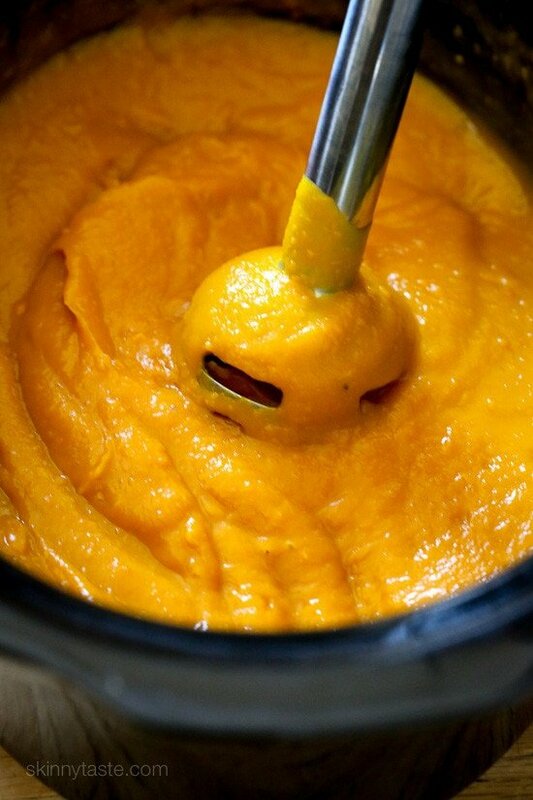 This is the easiest, creamiest, yummiest Fall slow cooker soup recipe – perfect for all you butternut lovers out there! Using only a 6 ingredients and very minimal prep (no need to peel the squash), you will have yourself a creamy, dreamy winter squash soup to satisfy your soup loving soul. It’s also gluten-free and vegan which is great if you have dietary restrictions at home. 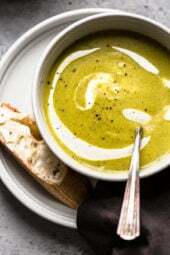 This soup was a huge hit at home yesterday! I had half the butternut and half the buttercup left over from the Roasted Winter Squash Medley recipe I posted this week, and decided to make a soup with it in the slow cooker. But it was early, and I was feeling lazy and didn’t feel like peeling it so as an experiment I did this in the slow cooker with the skins on much like you would if you roasted it in the oven. This was so EASY, the squash came off the skins with a spoon in minute once it was cooked! I didn’t completely immerse the squash in broth, instead I just put 2 cups along with the shallots and turned it on 4 hours high. Then I added coconut milk and pureed it. 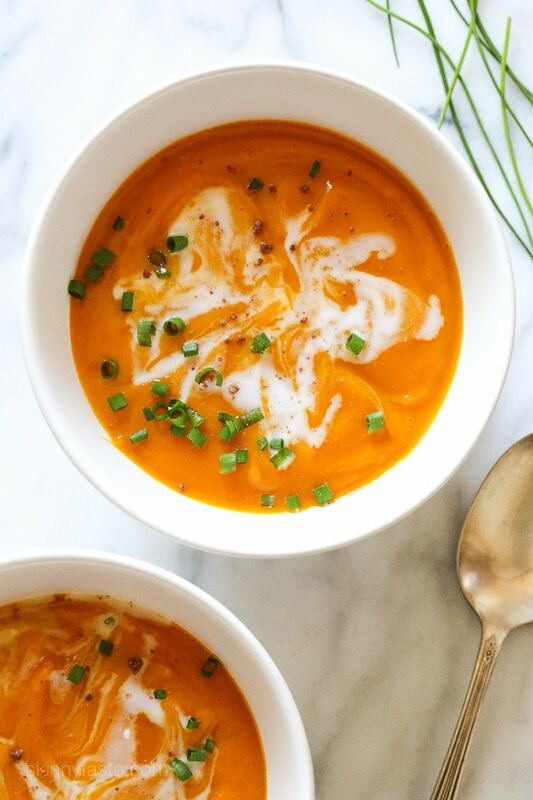 Topped with a little more coconut milk and a pinch of nutmeg, this soup had us all swooning with every spoonful. 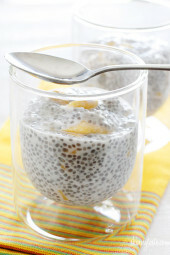 This is so good for you, and loaded with 9 grams of fiber! 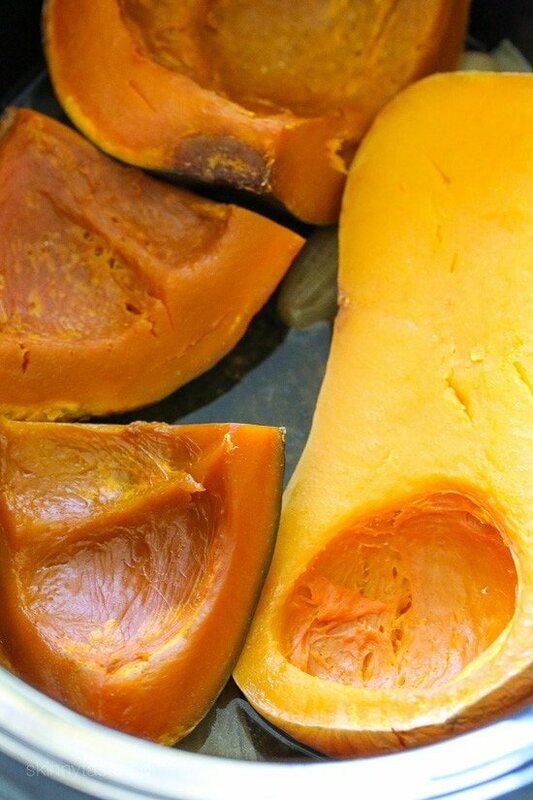 If you wish to use all butternut, that’s fine, just be sure to cut it in half before putting it in the pot. You can add more broth to thin it out if it’s too thick, I found this to be perfect. Here’s a few more Soup Recipes you may also enjoy! This is the easiest, creamiest, yummiest Fall slow cooker soup recipe – perfect for all you butternut lovers out there! This soup is amazing! I made it several weeks ago. I used a whole butternut squash only. Cooked it on low (always better if time allows) for the time recommended. It was great. Missing a little something, so I added some cinnamon as I served it. Heats up well in the microwave. I froze a good portion of it. Took it out of the freezer this week. Defrosted very well. Heated up in micro very well. Again, added cinnamon after it was heated. FANTASTIC! This would work well to impress a group of dinner guests or to enjoy on a cold winter’s day. When I re heated it recently, I added some chicken I had in the fridge because I needed some protien. It paired very well! I can’t recommend this soup enough! I’m making this today so I added it as a food to my WW tracker (using Freestyle) and using the nutritional info you provide at the end of the recipe this WW calculator says this is 5 Freestyle points not 2. Just wondering what the difference is? Hi Megan! The only accurate way to determine any recipe’s SmartPoints® value is to plug the ingredients into the recipe builder on the Weight Watchers website (Click on “My Foods,” select “Recipe,” and click “Create a recipe.”) which does not count fruits and vegetables in recipes in the calculations as they are now 0 points. Gina,You are such an inspiration! 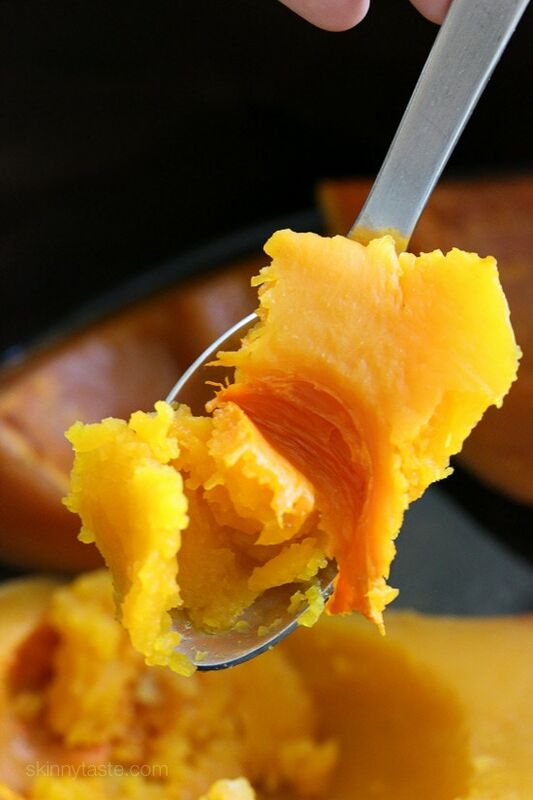 You have convinced me to eat butternut squash and actually enjoy it! I tried your butternut squash with chicken sausage & spinach over pasta earlier this fall and enjoyed it so much I decided to combine parts of that recipe with this soup to create a savory soup that was incredible! 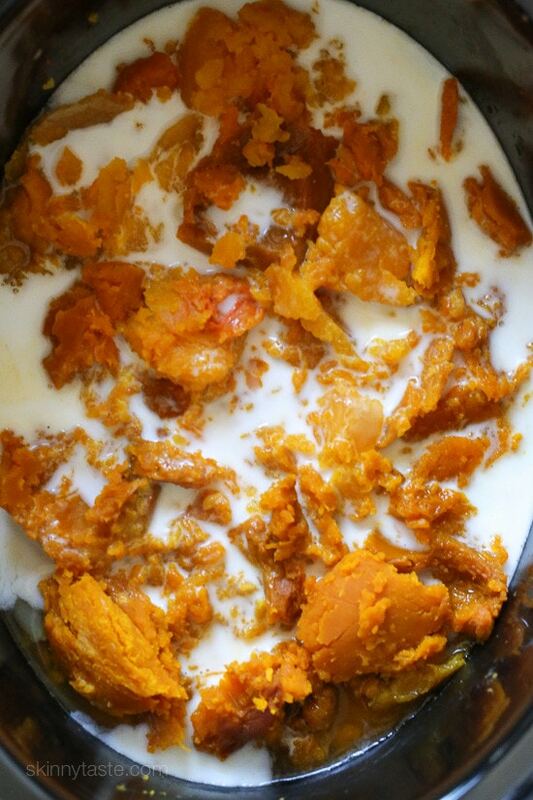 I used your method of slow cooking the squash and instead of coconut milk I blended in some fat free cream. I then added cooked, crumbled chicken assuage, a little sage and fresh spinach and let it all sit in the crock pot for another 30 minutes before serving. It was delicious!!! I enjoyed it so much I had the leftovers at 11am the next day; I couldn’t wait until noon for lunch! 🙂 Thank you so much for all that you do! Just made this for the second time. It’s so ridiculously easy. I add a splash of maple syrup before blending. The recipe was easy and it is delicious. I prefer to peel off the skins before I place in crockpot My whole family loves it I have made this many times. Such a great recipe. I ended up doubling it since my butternut squash was so large but added only 3/4 cup of coconut milk. Would highly recommend! Do you have any suggestions for making this in the Instant Pot? Would 20 minutes on high be appropriate? Wow this came out perfect and so simple to make. Really good and low in calorie. This recipient is a keeper. I read through the comments hoping to see this answered, but it wasn’t. My husband is allergic to coconut. I have FF milk. Will it be ok to use instead? This looks amazing! Is there a way to do this recipe if you don’t have a slow cooker? I can’t find buttercup or the Kobacha squash, what can I use instead? Also, I’d like to add some form of protein, what do you suggest? Some sort of smoked ham? If you use chicken broth you will have plenty of protein. I’m vegetarian so I added some red lentils for protein. Very good and very filling. I’ve made this several times. Delicious and super easy! Make sure you wash the outside of your squash first. Works with any type of squash or pumpkin. I microwave my whole gourd for a few minutes to soften just a tiny bit and make them easier to cut in half. Not too much or they will explode! IS it easy to cook if I don’t have a slow cooker or Instant Pot? I’m no expert, but I’d bet you can cook it in a heavy covered pot on very low heat on the stove and it would work fine. Has anyone ever tried adding apples to this? Results? ? Is there an instant Pot conversion? I made this quite a few times last autumn. It’s delicious and I even played around with all butternut vs. half butternut and half acorn squash. The second was my favorite. Looking forward to making more of this soon! Do you drain off the chicken broth when you scoop out the squash or just add the coconut milk to the broth? The video wouldn’t play, so I couldn’t double check that way. Easy to make and totally delicious. This was so delicious! I made a double batch and froze the leftovers. Everyone loved it – in fact so much that I am all out of leftovers and making it again. The perfect winter soup! What kind of salad would pair nicely with this soup? I’m a bit confused….do I include the stock and the shallots in the blender? This is so amazing! I love it! I did it in the Instant Pot. 20 minutes pressure cook with a 15 minute natural release. The squash fell apart when I tried to take it out of the pot. It made it hard to remove all of the skin. Is that normal for squash, or do you think I cooked it too long? Thanks! P.S. Only change I made was to add red pepper – I love the kick! Is the points Freestyle points? or the old points? Can you use 1% milk or rice milk, we don’t like coconut anything and am not s fan of almond milk. Delicious. I substituted the coconut milk with a can of cannellini beans and a cup of water. I rinsed the beans well and then purée’d with the squash. This provides additional fiber and protein and adds the creaminess. Will be freezing this in Mason jars (leaving an inch at top for expansion). This is a must try!! Enjoy! Is it ok to use water instead of chicken broth? This was delicious! Didn’t have nutmeg, but went for a Thai style and added garlic, red curry paste, a little coriander, cumin and just a bit of red pepper flakes ???????? When I saw the coconut milk as an ingredient, I immediately thought of adding red curry paste and garlic. Maybe a squeeze of lime juice over the top? Yum! I love Thai food! Blissful is an honest description – THIS SOUP IS ABSOLUTELY AMAZING! Tasty, sweet, creamy, and I’d never tried canned coconut milk before but now I know what I’ll be using to thicken up my coffee forever 😀 I’ll be honest, I was a little sketched out by the idea of cooking the squash with the skin on in the same broth that I would be eating. I washed the squash but I don’t know how dirty they are or if the little rough spots would end up in my soup and I was looking everywhere for someone to clarify if you use the same broth (I missed Gina’s comment last night in my haste smh. I did use the broth and the shallots when it was all said and done). Also, when I was scraping the flesh out, the skin kept falling apart so it took longer than I thought it would to get the meat without wasting too much of it. That being said….I had tried to peel squash for the first time as this recipe was cooking and I broke my peeler 🙁 so no complaints from me about the slow cooker method! So many wins for this novice chef. Thank you so much!!!! This soup is delicious! I made it last year for Thanksgiving. I just wish it was a little thicker. Any suggestions? 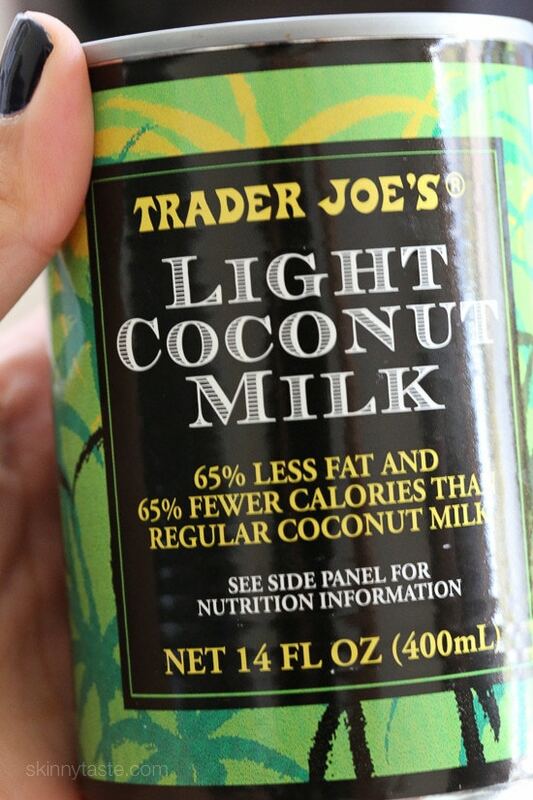 Would using regular coconut milk instead of light coconut milk accomplish this? Thank you! Regular coconut milk and a little less broth. Start by blending the squash flesh, nutmeg, coconut milk and shallots and then slowly add the broth until you get the desired consistency. Great! At least 3 to 4 days! Question: Can’t tell if I am supposed to discard the broth and shallots or use them, together with the coconut milk, in the puree. Didn’t even do crockpot, sautéed shallots in veg oil then added roasted squash and chicken broth. Simmered for 1hr, blended, then added coconut milk stirred for a while and put in frig till next day. Came out great. Thanks. May add turmeric or chili flakes next time. If I am using half of each squash what do you suggest doing with the other halves? I have a delicata squash i need to use, do you think it will be okay to use that & butternut squash instead? Also would 1% milk be okay instead of the coconut milk? Thanks. Seriously???? This soup is amazing! I keep thinking every Skinnytaste recipe I try is the best… until I try the next one. This soup is ridiculously easy. My store carries pre-cut, peeled butternut squash. It really could not be any easier. And it is delicious. Thank you, again Gina. This recipe is fantastic. I have a feeling we will be making this A LOT! I love this soup and want to try it in my Instant Pot. Can I cut the squashes in quarters with the skin on and cook, then remove skins ? How long would you cook it for ? This recipe was very good. I would peel the squash before putting it in the slow cooker because it was a beast to scoop out later. A little thin, but that’s probably because it’s healthy. Not sure I’d make it again, but only because I have so many wonderful soup recipes – many from SkinnyTaste. I was thinking the same thing when making this. Given it said quartered, I assumed it’s was referring to two whole individual pieces, not two entire shallots. Don’t known if that was correct. It is cooking now so guess will see how it comes out. Oh my. So good. Finally found a use for the buttercup squash! Do you put the squash back after removing the skin in the crock pot with the broth and onion and then add the coconut milk and purée? Gina I love all your recipes so much! The creamy zucchini soup is now a standard for me. Making this one today and I already know I will love it. Thank you from the bottom of my ❤, you make me want to cook again! Making this now but only with butternut squash because I couldn’t find the others. My family and I Love your recipes! I frequently see coconut milk as a main ingredient. Can you offer advice on best substitute for this? I am very allergic to coconut anything but have several soups of yours I want to try this fall. Loved this recipe! So easy & healthy. We have already made it twice in a week! Next time we are going to double the recipe. I really liked the soup, would make again. Thanks for your recipes. I was a little skeptical as I’ve been on a quest for great butternut squash soup for years. This is IT. I used all butternut,, followed directions exactly and found it delicious at the end. I wanted a little more kick so I added about a teaspoon of curry and it knocked it out of the park.. THANK YOU! You’re welcome Kelly! Glad you enjoyed it! I just made this tonight and it was absolutely delicious. My husband, who seemed hesitant at first, was licking his bowl. We accidentally ate it all and now don’t have leftovers so will have to make it again! I made exactly as said and added a little cinnamon as well. Thanks this was great! So glad you both enjoyed it! Maybe double it next time? Instructions are confusing. So really it is 32oz of squash? This freezes nicely. I use almond milk and you can’t freeze that, so I just added milk to the portion I wanted til it was the consistency I liked. Could you freeze any leftovers? Yes! It froze and thawed very well! Made this for dinner tonight and it was such a hit! You could really taste the coconut and the seasoning was simple but perfect. Will definitely have to make this again! I just made this for lunch. I used a butternut squash and I added a sweet potato. It was excellent! I love your recipes and I’m a long time fan. THANK YOU. Now, on to my question. I want to make this in my instant pot. How long do you recommend? I’m guessing since I have not tried, I think it would be fine in 20 minutes. Any suggestions on making this if you dont happen to have slow cooker or instant? You can cook on the stove until tender. Maybe 1 hour low? When I opened my can of coconut milk, there was a 2-3 inch layer of solid and then a liquid. Do we throw out the solid and use the liquid or vice versa OR is my can spoiled? I’m afraid to use it as I’ve never used coconut milk before. That is correct, you should shake the can good before opening. When I enter the nutrition info into WW for Smart Points I get 5….not 2. Big difference. Could I use unsweetened soy milk? Family does not like coconut milk. Thanks! I haven’t tested it this way, but I am sure it would be fine. When I enter the nutrition facts into the WW app, the serving is showing up as 5 smart points instead of 2. Am I doing it wrong? Yes you are. The only accurate way to determine any recipe’s SmartPoints® value is to plug the ingredients into the recipe builder on the Weight Watchers website (Click on “My Foods,” select “Recipe,” and click “Create a recipe.”) which does not count fruits and vegetables in recipes in the calculations as they are now 0 points. This soup is OUTSTANDING!! Thank you so much! We are making the butternut squash blissful soup and are trying to figure out when to put the pumpkin seeds in. Do we roast them? Cook them in the soup? LOL. You don’t eat the seeds. Pepitas on ingredient list are for garnish when you serve soup , if you want them. Don’t have to use tjough. This is the best! I made it today. I added 1/8 tsp of nutmeg, 1/8 tsp of salt and pepper prior to immersion blending. So thick and creamy! I love this soup. I’ve added just a touch of red pepper flakes and turmeric to the recipe to give it just a little kick, and it’s amazing. I’ve actually made it now, twice in the same week I loved it so much! This was excellent! I wanted to provide feedback because I used my instant pot because I was low on time and it was a lifesaver. I used 2 pounds of precut butternut squash and basically followed your directions by putting it with the chicken broth and onion (didn’t have shallot) first. I put it on the soup function for 33 minutes. When it was done I let the steam out and added the coconut milk and nutmeg. I also added a bit of cinnamon. I used my immersion blender to mix it up and it was fantastic! Thank you! Thank you for sharing this tip! I used this instant pot method and I am so happy with the results! I was just going to ask about adapting this for the IP! Thank you!! Thank you for providing the IP instructions! I shall give this one a try! I used this tip and it worked great, too! Added a little chili powder to mine and it was delishhhh! I’m making this right now and have a feeling I’ll want to double it next time. With that said, do you think it matters if the squash halves are stacked? I noticed in the photo you have yours with the skin side down. I have mine the other way. Just curious which way you’d layer them if you doubled it since the pieces will be too big to all rest on the bottom. Thanks!! It doesn’t matter, either way will work. This was awesome! 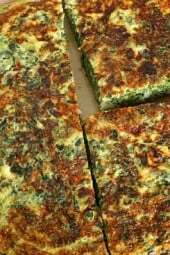 I made it with all butternut & we loved it so much, that I’m making it again next week, but doubling it. I’m probably going to try it with pre-cut squash though to make it even easier. instead of using 16oz. 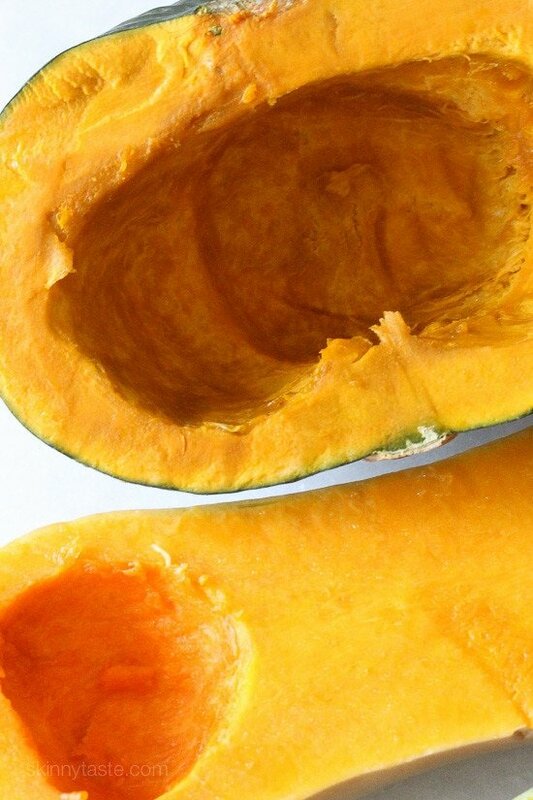 of buttercup or kobacha squash, can you just use butternut squash for the entire recipe? What is Kobacha squash? Could you use the whole butternut squash instead of half of each? It is a type of winter squash. Sure, that should work fine. I have a package of precut butternut squash in the fridge. Will this work? Do I need to adjust cook time? Same time, that should work! Can you please tell me where to find the IP recipe? Thanks!! I just put all of this in my crock pot and accidentally added the coconut milk to crock pot. I was rushing and didn’t read all of the instructions . Do you think that’s ok? Won’t be the same but should still be ok to eat. Going to try to make this tonight, but was wondering if can substitute green onions in place of the shallot since can’t find shallot at store, if can substitute how much of green onions to use? What would you serve with this? I would love it on it’s own but my husband would need something else. I used heavy whipping cream, whole or 2% should also be ok. I substituted almond milk and it was awesome!